LN no.4 or veritas no.4 custom pmv11? I went with the LN 4 1/2. The reason is that the frogs and blades are interchangeable among LN 4 1/2, 5 1/2, 6 and 7 planes. Down the road, I can get a 5 1/2 and 7 in 50º and 55º frog angles and have a very versatile package of planes. That’s an interesting thought. Does the veritas 4 1/2 custom have that option? I love my LN 4-1/2. I do not own very many planes but use this for lots of things including as a shooting plane. That s an interesting thought. Does the veritas 4 1/2 custom have that option? I don’t know about that. I’m sure it’ll say on their web site. I’m surprised. Seems like maybe the 4 1/2 might be a better option ? I went with a Veritas #4 L.A. smoother and a #4 Custom with 55 deg. frog, both with the PMV-11. Already have 3, 4, 5, 5 1/4 and 6 Stanley’s all with PMV-11 blades. Think I will get the Veritas L.A. Jack someday. I did the same thing. I have a LN number 4-1/2 and a number 7, one with the 45 degree frog and one with a 55 degree frog. Pretty hard to go wrong with that set-up. Yes, there is the whole aesthetics thing. I have the Bronze LN-4. Planning to get one of the high angle frogs for it. My other Bench planes are Bedrocks. They could also be a consideration. I have both the Custom #4 and a LN bronze #3. Both are excellent users and capable of smoothing the most interlocked grain. However, to do so, you need to be proficient in setting the chipbreaker around 0.3 – 0.4mm from the edge of the blade. The LN started life with a 55 degree frog. I hated it. Hard to push and did not provide the ultimate performance I sought. I swapped out the frog for a 45 degree. 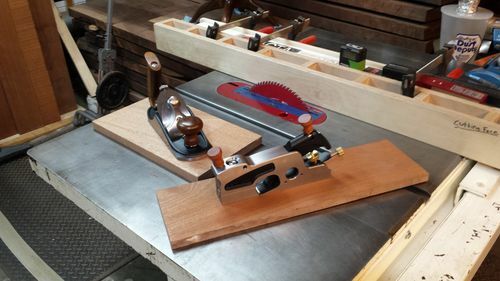 The lower the frog, the lower the cutting angle, and the smoother the finish …. as long as you set the chipbreaker. The Custom #4 has a 42 degree frog. So it is a slightly better performer than the LN. Setting the chipbreaker is easier with the custom planes than Bailey planes as the screws are the right way up (bettr visibility). My review of the Custom planes is a useful read to understand what to purchase, and why. Congrats on your new planes, they look great. Why is the LN a better choice? I would think performance is the top consideration, not the appearance. Mine works fine. Seems most are happy with the performance along with a traditional look.